Did you feel like you were living in a war zone this 4th of July? The loud thunderous blast from fireworks —most presumably illegal — rocked Angelenos from every direction. EGP has heard from many residents that they were forced to endure the incessant sound of exploding fireworks for hours on end. The intensity and number of blasts this year from M80 rockets and other powerful fireworks far exceeded what many considered normal for the neighborhoods. On street after street, fireworks that rivaled the red, green, blue and white flaming lights of sponsored and organized displays filled the night sky. But these were not professionals trained in handling the dangerous explosives putting on a show, but amateur thrill seekers who thought nothing of putting their lives and those of their family, friends and neighbors in danger. The explosions were so powerful and numerous they set off car alarms, made windows shake and drove both pets and their owners unable to find refuge into panic. Where were the police patrols looking for the barrage of illegal fireworks? Residents tell us they weren’t in their neighborhoods. Were they all busy guarding the big shows, potential terrorist soft targets? Whatever the answer, it seems Angelenos across the county were left to their own devices to deal with what we are tempted to call a terrorist attack at home to get the issue the attention it deserves. The numbers of injuries and size of the seizures of illegal fireworks is alarming, but clearly, far more illegal and dangerous fireworks made it into the hands of consumers than was confiscated by law enforcement. The 4th of July has come and gone yet in many neighborhoods the loud blasts continue. The illegal use of fireworks — and we’re not talking about the so-called safe ‘n sane variety — is getting bigger every year. It also appears that our law enforcement agencies are less and less able to control the lawbreakers. There does not seem to be any real concerted effort to stave off the mayhem that comes with illegal use of pyrotechnics. Why not? How can we expect our law enforcement agencies to protect us against terrorism when they can’t even stem the overt and blatant sale of illegal fireworks that can also be used for malicious purposes? We understand that most people see fireworks as a great American holiday tradition and loathe the idea of not being able to engage in the activity with family and friends. But the fireworks that once were suitable for backyards and driveways have morphed into something much more dangerous. If the lawless Fourth of Julys continue, we fear it’s only a matter of time before the scofflaws feel they can continue to skirt the law whenever they please, putting us all in more danger. Authorities Wednesday warned Southlanders that officers will be out in force during the three-day Fourth of July weekend looking for motorists driving while impaired. The “maximum enforcement period” begins at 6:01 p.m. Friday and ends at 11:59 p.m. Monday, the CHP reported. “All available officers will be watching for motorists who are speeding, distracted or driving under the influence of alcohol or drugs,” said CHP Commissioner Joe Farrow. “Saving lives is always the first concern for our officers,” he said. During last year’s holiday weekend, 26 people were killed on the state’s roadways. People are urged to report drunken drivers by calling 911. The sound of powerful, commercial grade fireworks exploding across the city is growing every day. The problem is they are not coming from fireworks displays being put on by professionals, but from amateur thrill seekers who are putting all of us in danger. The illegal fireworks available today to consumers on the black market are often 100 times more powerful than those sold at regulated firework stands in some local cities and designed to be used by trained professionals. They pose a serious threat to all of us, especially given the heightened fire danger due to our prolonged drought. This week, a study published in a journal of the American Geophysical Union, supported the arguments of state hydrologists that it will take until 2019 to recover from the four-year water shortage. Water conservation rules in response to the extreme conditions have left hillsides and vegetation around homes bone dry, ready to spark at any moment. If you need more evidence of how dangerous fire conditions are, you need look no further than Santa Barbara, Azusa or Duarte, where thousands of acres have burned, forcing thousands of residents to be evacuated. Couple those conditions with the irresponsible use of fireworks and you have any number of time bombs ready to explode. That’s why it is so surprising to us that there has been little public reaction to the danger that these illegal fireworks present. Don’t their users recognize the danger? How about their friends and family? Why don’t they speak up? We’ve concluded that it’s time for each one of us to look out for these dangerous pranksters, and to let them know they are putting all of us in harm’s way. If that doesn’t stop them, it’s time to call 9-1-1. There were hundreds of them: U.S. flags battered by years of exposure to sun and pollution, a far cry from the vibrant red, white and blue of their “Old Glory” days. Last week, the Vernon Chamber of Commerce hosted a ceremony to retire faded and torn flags they had collected from area businesses and the homes of individuals that were in danger of being discarded in trash bins, a disrespectful end to the best-known symbol of U.S. independence, the red, white and blue American flag. This Saturday, people all across the country will display the flag as part of their Fourth of July celebration. Many will have no clue that there’s an etiquette that goes with flying and caring for Old Glory and for disposing of the flag when it falls into disrepair. Boy Scout Troop 419 led last Thursday’s flag ceremony at Vernon Fire Station 1. The troop is located in Vernon but none of its members actually live in the city. Some of the younger Cub Scouts attend Vernon Elementary; most live in the bordering cities of Cudahy, Maywood and Huntington Park. They meet at the Vernon Fire Station. For 12-year old Boy Scout Andres Soto, expressing what he feels when he sees the U.S. flag does not come easy, he just knows he’s proud of the country he calls home and grateful to all the servicemen and women who fought, and are still fighting, to keep the country safe. “A lot of people think ‘it’s just a flag,’ that could just be thrown away, but it should be respected,” Soto said. “We’ve had to do a lot to get our flag, it represents years of fighting and the laws and changes we have had from then to now,” the scout said. According to the United States Flag Code, worn, torn and faded flags should not be flown but retired with dignity, preferably by burning. There are organizations across the country, such as The American Legion, Veterans of Foreign Wars and Boy Scouts of America that understand how to properly retire a flag, and many chapters hold retirement ceremonies on Flag Day or military holidays. Boy Scout Connor Esquivel, 11, was charged with starting the fire where the remnants of red, white and blue would eventually go up in flames. He said the flag reminds him that America is a free country. “The flag flies over the best nation,” he said excitedly. Flag retirement ceremonies are usually steeped in tradition and formality and Vernon’s ceremony was no exception. The flags were displayed to the audience of police, firefighters, city officials and others. The history behind the national symbol – the star spangled banner – was explained before the flags were cut into pieces and placed into the fiery pit. “When I see the flag I think of a Marine,” said Fremd, who volunteers at the Camp Pendleton Marine Corps Base. Vernon Mayor W. Michael McCormick is the troop’s scoutmaster. 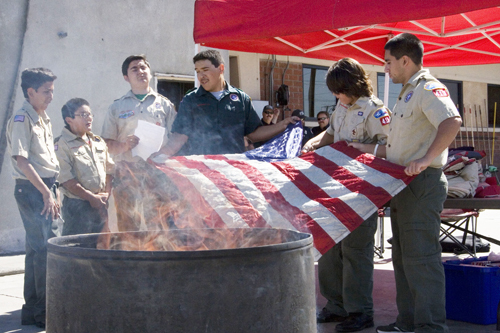 He told EGP most people don’t realize there’s a proper way to dispose of a flag and recommended that residents contact their city, local boy scouts or veteran’s group when they have a flag that is no longer in good shape. For Vernon Firefighter Jason Rosa, a former Navy officer, it means so much more. The Vernon Chamber is selling new flags and proceeds will go towards the Vernon-area Boy Scout Troop 419. For information, call (323) 583-3313. For more than two hundred years, Americans have been celebrating the 4th of July with parades, picnics and the exploding of bright and colorful fireworks in the skies above the nation. It’s a “patriotic” pastime that can pose a substantial danger to land and limb. Over the years, the fireworks available to consumers have become increasingly powerful, rivaling what one used to only see in professional firework displays. They can be heard and seen for days, even weeks, before and after the 4th of July holiday weekend. It has at times seemed futile for police to try to enforce the ban by the City of Los Angeles’ and many other local municipalities on individuals setting off fireworks, especially since the cities that have banned local sales of fireworks have had little success keeping them out. Because many neighboring cities allow the sale and use of so-called “Safe and Sane” fireworks, making them readily available to anyone willing to drive a few blocks to buy them. Every year, the skies above Los Angeles are clouded with the smoke of illegal and dangerous fireworks bought from underground vendors and safe and sane fireworks stands just across city borders. Firefighters and emergency room doctors are bombarded with calls for help when things go awry, and people are injured. Yet, it seems most people do not fear fireworks and feel they can control the explosives. In our view, there is no such thing as “Safe and Sane” when it comes to fireworks. The risk they pose to the community, in terms of loss of property and bodily injury, is potentially too high a cost for a few minutes of entertainment. And this year, there’s even more reason to not allow individuals to put on their own firework displays. Severe drought conditions have left our hillsides, parks, trees, grass and brush all over the county very dry and brittle, dramatically raising the risk of fires close to home. These conditions are a threat to every neighborhood, to every home in every neighborhood, so residents should think seriously about the potential deadly practice of combining flammable materials and fireworks for a few minutes of fun. We are disappointed by the number of local city councils that failed to adopt fireworks bans this year given these extreme conditions. Not to mention the large amount of water it takes to put out a fire. Public safety agencies are already receiving reports of homemade bombs and firecrackers being exploded, yet it’s likely most people just don’t have enough common sense to report those using illegal fireworks in their neighborhoods. Enlightened self-interest should tell us that it could be our home, school or neighborhood that goes up in flames when a spark from a seemingly harmless sparkler is carried through the air. This year let the professionals put on the show. 2-10pm?Carnival & Fireworks Show. Enjoy live music, food, carnival games & family activities. Fireworks show at 9pm. Park is located 700 S. Almansor St. 91801. For more info, call (626) 570-3242. 1:30-4:30?Have fun with a giant inflatable water slide, ($1 per person), refreshments, carnival-like games, watermelon eating contest, music, and more. Park located at 8000 Park Lane, Bell Gardens, 90201. For more info, visit www.bgrecreation.org/aquatics. July 2-5 —Four-Day Carnival. Family fun with rides, food and live entertainment. Ride tickets now on sale & for purchase at event. Thurs; 5-11pm; Fri 10am-7pm; Sat 10am-10:30pm; Sun 10am-7pm. July 4th —Freedom 5k Run at Park at 8am; Special Fireworks Show 4th of July at 9pm. Rosewood Park is located at 5600 Harbor St. Commerce, 90040. For more info, call (323) 887-4427. 3-9:30pm?Music Center Presents Grand Park 4th of July LA-Style Block Party. Free event, will feature music, art, dancing, food, family, friends and fireworks for a feel-good, hometown event; first-ever rooftop fireworks display set to iconic American music will light up city skyline. Location: 8 city blocks from Temple Street to 2nd Street, and from Grand Avenue to Main Street. Avoid traffic & parking delays & take Metro – www.metro.net. For more info, visit http://www.grandparkla.org/event. 3-7pm—Outdoor Concert at El Pueblo/Olvera Street in Downtown L.A. Mexican Cultural institute Presents “Rock en Espanol” in the Plaza Kiosko. Take Metro to Union station. 3-10pm—Free 4th of July Entertainment, Concert & Fireworks at Barnes Park. Event features concerts, food & fun for the entire family. Performing in the Amphitheater: Monterey Park Concert Band; youth band Mugen; Rudy Macias Band & special guests. Barnes Park: 350 S. McPherrin Ave. For more information, go to www.montereypark.ca.gov or call (626) 307-1388. 2-10pm?AmericaFest at the Pasadena Rose Bowl. 89th Annual Independence Day Celebration is Southern CA’s largest fireworks show. Live music, movie viewing, motorcycle stunts, food vendors & more. Tickets required, call Ticketmaster (800) 745-3000. Rose Bowl: 1001 Rose Bowl Dr. Pasadena 91103. On July 4th, 1776, a new nation was created based on the idea of rule by the people. This was radical and the start point of a great experiment in social contracting wherein rules led citizens not rulers. We have seen over the past week our vision of democracy at work, providing the world a grand view on how a three-branch system of government, conceived to protect our citizenry from absolute power, was made manifest through rulings of the Supreme Court. Whether you agree or disagree with the high court on the issues it has reviewed, you must acknowledge it has succeeded in performing its particular duties by evaluating laws passed by the Congress and signed by the President and examining how our Constitution works when presented with modern societal concerns. Those who crafted our constitution were keenly aware that what they were about to develop and eventually launch had been discussed for years – with no motivation to actually attempt a true democratic state anywhere else in the world. Why? Because giving people the ability to rule would cause problems, mostly due to our inability to agree, put aside our own immediate interests and our seemingly natural instinct to fight one another. Our founding fathers had great courage to try to implement a new system of government; one where conflict could occur but through rationale processing be dealt with and eventually accepted by one-side or the other. As the inheritors of this democracy, we each have a fundamental duty to participate, whether through the exchange of our vote on Election Day, or, as is more common today, signing an online petition. We must be present. And we should never take for granted our ability to be involved in the political process. Before our constitution was adopted, the Articles of Confederation called us a League of Friendship. We have grown to become an American family where we may disagree at times but know how to stay together at the end of the day. As a collective, a Tabula Rasa – we are authors of our own character, or to put it another way, we are equals. And as equals we must continue to press forward to keep this experiment alive in order to prove to the world, what was once considered impossible, that government of the people, by the people, for the people shall not perish from the earth and will continue to thrive here at home and across the globe. Garcia is a resident of Montebello. Dangerously dry hillsides from years of little rain has fire officials across the state worried that fireworks could spark a new round of wildfires, putting people, animals and structures in danger. Serious injuries and millions of dollars in property loss happen each year from wildfires sparked by fireworks, warned CAL FIRE, a state agency. In 2014, CAL FIRE responded to 1,000 more wildfires than in an average year and the trend for 2015 appears to be continuing if not surpassing that number, according to the agency. Fines for illegally selling, transporting or using fireworks that don’t carry the “Safe and Sane” seal can be as high as $50,000, Cal Fire warned. It’s not just the forest and outlying areas that are at risk; extremely dry brush on local hillsides also poses a high fire danger to residents across the county. 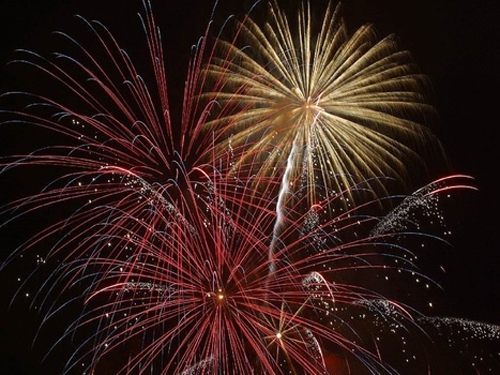 Fireworks also often correlate with an increase in hospital emergency room visits, according to physicians who urged the public to use common sense this Fourth of July when it comes to using fireworks. Eight people died and more than 11,000 people were injured due to fireworks in 2013, according to the Consumer Product Safety Commission (CSPC). Those figures have significantly increased over the years. Sixty-five percent of those injuries occurred in the days surrounding Fourth of July festivities. It’s estimated that nearly half of all injuries were a result of sparklers and rockets. Over 45 percent of cases involved injuries to a person’s hands or fingers. One-third of injuries were to a person’s eyes, head, face and ears, according to CPSC. “You should only watch a professional fireworks display managed by experts who have proper training and experience handling these explosives,” said Dr. Gerardi. City of Los Angeles: Prohibits the selling and using of all fireworks, even those with the so-called “Safe and Sane” label. Vernon: Fireworks may be sold within the city but the use of fireworks in the city is prohibited. Bell Gardens: Fireworks may be discharged within the city beginning noon on June 28 until noon on July 5. Commerce: Fireworks may be discharged within the city beginning noon on June 28 until midnight on July 5. Montebello: Fireworks shall only be discharged within the city boundaries on July 4 between noon and 10 p.m.
Monterey Park: Fireworks may be discharged on July 4 between 10a.m. and 10 p.m.